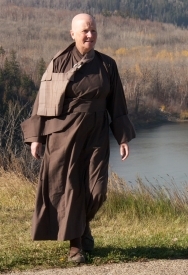 It’s the twenty first of January and the anniversary of my late Master’s monastic ordination. That was back in 1962. What better time to get back at it and start posting regularly again. This was an expression she often used to informally signal a gear shift. Community tea to work. Informal get-together to…work. Getting back at it was basically the same as get on with the next thing. What is the next thing? When I think about it get back at it is fundamental to how we function within this tradition. Do the work that comes to you is the guiding principal. And one can drive a bus load of confusion through that phrase, however taken simply and directly, this means…get back at it. All day every day switching gears happens almost imperceptibly and in there is a sort of call and corresponding response. Thank you to those who have been asking after my health. Even though I’m still limping along on borrowed computers I can say, with reasonable confidence, that I’m now back on my feet. And dare I say it again, back at it! And a special thank you to the two monks who brought springtime to my room, pictured here. They too have monastic anniversaries today. Congratulations. Nice to see this post; I was begining to wonder if you were seriously ill.
Daffs are a wonderfull introduction to spring and the placement in photo shot against the lotus is good. Nice freshness in this teaching.